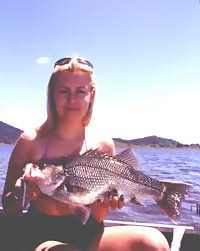 Bass on Metal - Lazer Fishing Lures, metal lures for saltwater and freshwater fishing. 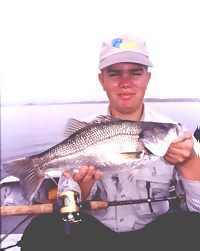 Big-water bass have adopted different habits from those in the natural riverine environment. Where stream dwelling bass are regularly encountered in water of only a couple of metres in depth, lake bass often mass at great depth. Depths in excess of about seven metres preclude the use of traditional diving plugs so anglers have adopted strategies involving the use of sinking lures. Lures need to get down very quickly to effectively fish these deep schooling bass. Metal jigs have proven to be ideal for this task and none is more effective than the small Lazers. The 25 and 35 gram Lazers are superb lures for jigging bass in deep water lakes. Jigging for bass involves a few distinct exercises. The first is finding the fish. Unlike looking for bass in the shallows we can't simply toss lures at snags, rocks or weed beds when fishing the depths. To find deep water bass we need to use a quality sounder to search suitable depths along the sunken stream channels. Most lakes will hold schools of bass in similar areas. Usually the schools will be suspending between six and nine metres below the surface in water at least ten metres in depth. In large lakes like Somerset, Wivenhoe and Glenbawn the fish will sometimes suspend at the same 6-9m depths over very deep water, up to thirty metres in depth. Once the fish are found the fun can begin. Jigs, especially fairly heavy, fast sinking jigs like the Lazers are best fished on plug gear. Overhead reels make the descent easier to control than a fixed spool spinning reel. Bass will often hit a Lazer on the drop so we need to have the lure under control while it is falling. Thumbing the spool to slightly slow the lure's sink rate will keep everything tight so that any touch from a fish is easily felt. If a hit is felt on the drop, lock your thumb onto the spool and engage the gears. You then know without a doubt that the Lazer is at the same depth as the fish. It is fairly common to see anglers unfamiliar with freshwater jigging working their lures far too vigorously. Remember that we aren't chasing kingies in fifty fathoms so there is no need to work the rod in huge arcs nor at high speed. This handsome bass hit a 15 gram red Lazer in BP Dam. Note the type of tackle that is ideal for bass jigging. Moderate upward sweeps of the rod to lift the lure about 80 to 90cm will impart quite enough movement to the Lazer to entice a strike. Dropping the rod tip too quickly on the down stoke will cause even greater problems. If the tip is lowered faster than the Lazer sinks slack will form in the line and strikes will be missed. It is also possible for the lure to tangle in the slack line, fouling the hooks. Once a fish is hooked it will often trigger others in the school to feed. While fish are being hooked a school of bass will often follow them and stay with a drifting boat for as long as it is in deep enough water. If you allow the boat to drift into the shallows the school may depart. The basic style remains the same whether the fish are on the bottom or suspended over deep water and needs to be varied little from lake to lake. In some areas it is a good tactic to stop the Lazer regularly while it is being dropped to the bottom. This pause regularly triggers strikes when a continuous descent goes unharassed. One theory is that a pause allows fish that are following the Lazer a chance to position themselves for the strike. Another is that the lure appears more vulnerable as if it is tiring, making it easy prey. Whatever the reasons, schooling bass certainly respond well to jigged lures. Personal favourites are the 25 and 35 gram models in any colour as long as it is green. Fish these on medium plug gear consisting of a fairly stiff rod between 1.65 and 2.1m with a matching overhead reel. Light GSP lines like 8lb Platypus Super Braid or 12lb Bionic Braid are ideal as they give unsurpassed contact with the Lazer regardless of the depth being fished. Remember, there is no better lure for jigging Aussie bass than the Aussie made Lazer. Step one, find a school of bass. Step two, drop a Lazer over the side and hang on. This superb somerset bass was fooled by a 35 gram green Lazer.